As my wife Beth and I arrived at the rental cabin, I turned into the empty spot next to it and parked. The pristine river flowing next to the cabin and the spectacular canyon through which it flowed were just part of the reason we were here. We were empty nesters, now, and it was our first vacation without children. As I unloaded our luggage, I noticed that the bicycles left next to the cabin by the rental office were apparently for children. I couldn’t argue with that—it stood in clear view a quarter-mile away. I carried our bags into the rustic, musty-smelling cabin and then rejoined Beth outside. We each grabbed a bicycle by its handlebars and then pushed them toward the office. Halfway there, it began to rain. Glancing up the canyon, I noticed that a torrential downpour was heading our way. “Okay. Hurry back.” Beth turned and walked briskly toward to the cabin. As I continued along, steering each bike with one hand, the rain fell harder and harder. Suddenly, an intense gurgling sound caught my attention. I turned to see a wall of water and debris consume a gentle tributary dissecting the opposite bank and burst into the river, instantly turning the clear water a rusty-brown. A moment later, a similar sound erupted farther away as another tributary abruptly flooded. Eventually, I arrived at the rental office. I leaned the bikes on their kickstands and approached the small building, which appeared deserted. I knocked on the door anyway, but no one responded. Shielding my eyes from the rain with my right hand, I could barely make out a man and woman standing under an umbrella atop a bluff several hundred feet above me. More out of curiosity than anything else, I hurried up the trail toward them. I had no sooner reached the top when the woman pointed up the canyon. My eyes widened and my jaw dropped at the sight of the mammoth swell of seething, muddy water advancing in our direction and demolishing everything in its path. It was at least a hundred feet tall. I was thankful that the man had warned me in time and that I was on safe ground. That’s when I remembered Beth waiting for me in the cabin. I was safe, but she was doomed. For a split second, my mind accepted that logical fact—I could do nothing to save her. Nevertheless, my heart felt differently: a life without Beth was not an option. I scampered down the hill with the man and woman yelling behind me. Ignoring their pleas, I continued my mad dash toward the cabin too rain-soaked to notice the tears streaming non-stop from my eyes. With precious little time to spare, I burst through the cabin door, raced to Beth and embraced her with all of my might. I pressed my lips against hers and kissed her, ignoring a roar that grew more frightening with every heartbeat. As it finally reached a crescendo, I awoke with a start. It’s common for me to awaken from a vivid dream with my heart racing and my body dripping with sweat, thankful that it was just a dream. Many dreams stick with me for days, taunting me with their hidden meaning. Eight such dreams ended up in my first two books: Detour from Normal and The Road to Amistad. Others became short stories, tucked away in a computer folder for future reference. What wondrous machines our minds are to create such convincingly real stories from seeming nothingness. This morning, I pondered the differences between my two novels: Detour from Normal and The Road to Amistad. Joined at the hip in many regards, these novels are nonetheless as different as night and day in a certain respect: one is about being alone and the other is about being together. In Detour from Normal, I was thrust from normalcy into a life of cold, heartless professionals and the tragically mentally ill. A normal person in my place would feel frightened and alone, and many of the experiences I described are from a solitary perspective. Instead of feeling terrified, I felt at peace, and at times, blissful. A mysterious process had freed me from judgment, expectations, worry and fear. That mindset allowed me to befriend people who were toothless, foul-smelling, crippled, rude or unable to communicate—people I would never associate with before. My best friend was a drug addict recovering from his eighth relapse who had lost his job, savings, car, home, wife and family because of addiction. Through different eyes, I found these people funny and interesting, and for those among them who felt frightened and alone, I became their guardian angel. It was an immensely freeing experience and I could not help but imagine what the world would be like if everyone could live life as I did then. The Road to Amistad explores just such a scenario. People from all walks of life were spontaneously freed from their mental prisons and introduced to my world overnight. Unfortunately, their changed mindset more often than not led to heartache as family and friends demanded the return of their absconded loved ones. A few managed to avoid that struggle and find a unity of spirit with others like themselves. Friendship and trust thrived regardless of former walls that separated them. They were magnets to each other, formed strong friendships and accomplished great feats together. None among them ever felt separate or alone. Nowadays, it is difficult for me to tread the line between alone and together. I have a wife, children, friends and a full-time job. There are many rules and walls that impede me and I have limited time and resources. It would be easier to abandon my vision and rejoin my former world, but I don’t want to close doors—I want to open them. I don’t want to be alone—I want to be together. I want to be part of something big. I hope that you will read both Detour from Normal and The Road to Amistad and open your mind to possibilities that are ours for the taking. If my message rings true, press the button; twist the throttle; swing; jump; do whatever it takes to begin your own journey, and as you go forth, spread the word so that you may do it together instead of alone. I stopped to pump gas at a Circle K in Tucson a while back and as I pulled up to the pump, I noticed a homeless man pushing a cart full of his meager possessions toward me. Hoping to discourage him, I left my door open blocking his way as I entered my credit card information at the pump. I didn’t want to say no to this man, but that’s what I normally do in such situations, not because I am uncaring, I just didn’t what to support a drunken lifestyle, believing that by withholding my generosity, I will somehow change his life for the better. Not to be deterred, the man made his way around the pump and caught me just as I reached for the nozzle. “A footy? “ I asked, clueless of what he was talking about. Before I knew it, the man wrapped me in a powerful bear hug. He was so happy that you’d think I’d offered him a million dollars. “You are so kind.” He said, hugging me even harder. Despite my reservations over hugging a hobo, I returned the hug equally strongly, laughing at the absurdity of the scene. Then, he did something really over the top: he kissed my head. A dollar means nothing to me. I make that much in minutes at my job. I probably have a hundred dollars in change sitting in my piggy bank at home from emptying my pockets every day just so that I don’t have to lug it around the next day. It accumulates like dirty laundry until there is enough to warrant me bothering with it. Eventually, the man stopped hugging me and with tears in his eyes, thanked me once again before continuing on his journey, clutching his dollar close to his heart. I proceeded to pump over fifty dollars of gas into my van in roughly the same time as our total interaction. I replaced the nozzle, screwed the gas cap on, and headed to spend another thirty dollars on pizza with my wife and children. Surprisingly, that hobo’s hug and kiss made my day. I wished I’d given him the five instead, or even both bills. After he left, I realized that this is his life. I wasn’t going to change it one way or another with money, but maybe I could make a difference by treating him like a human being for a moment, by sticking around and listening to his stories. I can only imagine the places he’s been and the things that he’s seen. Perhaps talking with him would make a bigger difference in my life than his. I’m crying as I write this thinking of the unfairness of it all. That hobo is equally the miracle that I am, blessed with the same extraordinary machine and unlimited capacity to thrive and succeed at anything he wishes. The only thing that makes us different are the beliefs and thoughts that fill our minds and the choices we make because of those thoughts. We are all capable of so much if only we knew how to get out of our own way. My Dad died on January 11, 2015, but this is not a lamenting of his death, it is a celebration of his life: a life well lived. “What is a life well lived?” You may ask. It is serving your country. Dad received full military honors at his funeral including a 21-gun salute in respect for his military sacrifice. It is recovering from failures and turning them into successes. Dad flunked out of college, then went back years later to that same college, Johns Hopkins, and received a BSEE, an MSEE, and a PhD. It is taking what life throws at you in stride and running with it. Dad raised four boys, only one of whom he planned. Each of us presented our own unique challenges but he accepted all of us with love. It is creating a bucket list and checking off every box. Dad petted whales in the Sea of Cortez, photographed unusual wildlife in the Galápagos Islands, explored China, and Europe, swam with fish in the Caribbean, and watched glaciers calve in Alaska. It is throwing caution to the wind and starting something new. Dad moved several times during his career, living in the East, Midwest, West, and a few places in between. In his fifties, he left a secure job with IBM and consumed all of his retirement nest egg to found one company, and then another. By doing so, he enjoyed success beyond his wildest dreams. It is sharing your good fortune. Dad donated religiously. He adopted a platoon. He created a scholarship fund for young people struggling, as he did, to go to college. He purchased school computers and equipment. He donated to the medical facility that restored his hearing with a cochlear implant. He put several children and grandchildren through college and helped a son and a daughter-in-law run for public office. He shored up fledgling family businesses and helped to buy first homes. He took many family members on trips to locations that they would never be able to afford themselves. It is using your mind to its fullest. Dad held 88 patents. His ideas changed the world in the form of super market and industrial bar code scanners. The largest observatories in the world use his inventions to analyze the light from stars. Dad read voraciously and contracted as an engineer almost until he died, not because he needed to, but because he loved it. It is having passion. Dad produced countless photographs of impeccable quality using the best photographic equipment available and his own darkroom. He possessed infinite patience when it came to capturing the “perfect shot,” whether it be at the top of a mountain or at the bottom of the ocean. He could hold his breath for four minutes thirty feet underwater while tracking a Queen Triggerfish or a Barracuda with his underwater camera. It is taking care of your machine. Dad lifted weights, swam, ran, hiked, and walked his entire life. He ate healthily, maintained a good weight and never drank, smoked or used drugs. He was the picture of health and vitality and had better endurance than almost any other family member had. It is always being optimistic, having a sense of humor, and looking at the bright side of life. In Dad’s last days of life, he could no longer fend for himself. My brother Dana helped him stand and get around. He was impressed at how solid Dad’s body was, even in its failing state and knew that came from years of exercise. He mentioned that to Dad. He grinned and flexed his muscles one last time, mocking death. My brother did not know whether to laugh or cry at his indomitable spirit. It is about family. Our family gets along better than most, but it has its share of drama. Despite this, Dad insisted that we get together every year—nearly thirty of us. I cannot remember when that started, but it continued for many years through the last year of his life. Knowing that his time was short, we honored him and my mother last summer at the family reunion. Every evening, we held a question and answer session and listened to my parents tell stories about all of our lives. It was the last reunion he would lead. It is saying goodbye. Whenever I visited Dad, he always stood outside and waved as we left. And he did not just wave, he continued to wave until he could no longer see us. Although my Dad’s health failed quickly at the end, and he could barely see or talk, instead of complaining or feeling sorry for himself, he used that time to make audio recordings for his sons, wife and extended family to let us all know how much we meant to him. It took every ounce of willpower he had left to do that, but he made sure the job was finished. I will miss you, Dad, but I am more inspired by how you lived your life than I am sad about your death. You showed me what a life well lived is. Now, it is up to me to follow your example. A few years ago, I dreamed of a small disabled child rescued from certain death by an elephant. In the dream, the child and elephant become best friends and share many adventures. When I awoke, I rushed to my computer and recorded the dream. Months passed. In early spring of 2013, my youngest daughter, Hailey, announced that she wished to volunteer for a month in Nepal. Not being ones to stand in the way of our fearless adventurer, we scraped money together for the trip and allowed her to sign up. In June of 2013, our 16-year-old daughter flew unaccompanied around the world to Nepal. For two weeks in a small town not far from the Chitwan Jungle, Hailey stood beside surgeons in a teaching hospital, asking questions as they operated. The conditions there appalled her. With no air conditioning, the operating room was sweltering. Sanitizing instruments between surgeries involved a few squirts of Windex, time permitting, otherwise, they rinsed them with cold running water. Hailey’s next assignment involved teaching English to young children near Kathmandu, but first, she and other volunteers seized an opportunity to explore the Chitwan Jungle. Public speaking always frightened me. A character in my newest novel wanted to improve his speaking skills. Perhaps sharing that journey would benefit me. In mid 2013, I joined Toastmasters. I survived the first few speeches, but the requirements for the next speech stumped me. That speech involved vocal range and variety. Wondering what I might present, I thought of Sashi and Alisha. I dusted off the story once more to fulfill the speech requirements. When the time came to present, I stomped like an elephant, hissed like a snake, and blew like the wind. I spoke feebly as a sickly Alisha and thunderously as powerful Sashi. As I delivered that speech, I realized that Sashi and Alisha had come to life. At that moment, I decided to publish Sashi and Alisha. In mid-October 2014, my editor informed me of an opportunity to pitch a children’s book to a publisher for ten minutes on November 15th. 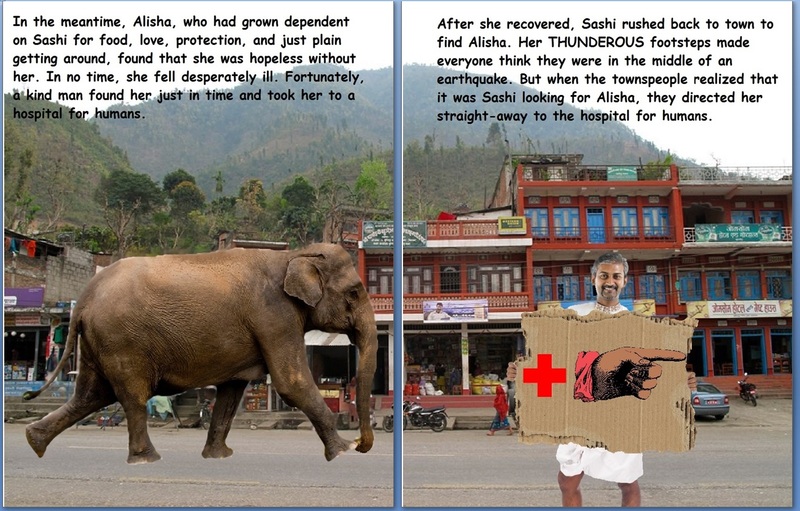 Having been through several rounds of editing by then, the manuscript of “Sashi and Alisha” was ready. I knew nothing about pitching children’s books, but was up for the challenge. To my dismay, I learned that the pitch required a full mock-up of the book–with artwork! I am not an artist by any stretch of the imagination. I’m an engineer: I create mechanical drawings with Autocad, and electronic schematics with Altium. In a pinch, I can draw something crude with Microsoft Paint. As I wondered what to do, I realized that Nepal was a beautiful place. I searched the internet and found a treasure trove of photos of Nepal, many from the Chitwan jungle. The solution was obvious. I just needed a mock-up. This wasn’t a book to sell. I needed something convincing enough to get me to the next level. For the last two weeks, I worked long and hard downloading images, cutting, pasting, and manipulating. I’m happy to say that it resulted in an unexpected work of art that I’m very proud of. Today, I’d like to announce that I finished the mock-up! This image is one of my favorites from the mock-up. Wish me luck with my pitch on 11/15! Imagine being swallowed alive by a python—the darkness, the smell, the inability to move as you are tortuously crushed, and asphyxiated. That’s exactly what happened to the pet in this story. Her name was, well, she had no name. Her life as a pet was short-lived, as she was never intended to be a pet at all. Purchased from a pet store under that guise, her real fate was to be dinner for that Python. One Saturday a few weeks ago, our pet rat, Emmy, lost a long, difficult battle against illness. Our family used to raise guide dogs, and we learned from parting with a beloved dog every year that the grieving process is greatly shortened if you get a new pup when you send the older dog back to guide dog school for final training. We weren’t embarrassed at all to end the grieving process quickly. So, right after giving Emmy her last rites, and burying her in the small rat cemetery under the Ficus tree in our back yard, we piled into our van, and headed to a local pet store to find a new rat to love. At first, we looked at a fresh batch of medium female rats, all in the same large aquarium, but they had not yet been handled, and were extremely skittish. It was difficult to discern their personalities, and dangerous to hold them because they could easily be dropped. The young male employee assisting us asked if we’d be interested in a rescue rat. We agreed to look at the one they had, a female isolated from the others in a small aquarium. I don’t know how my wife and daughter felt, but I have incredible respect for survivors, and I felt a connection to that rat right away. I convinced them that she was the rat for us. We shelled out a whopping $3 for the rat that was formerly snake food, took her home with us, and renamed her Mireille (pronounced me-RAY), a French name that means miracle. Nowadays, Mireille can be found almost every evening running around on the family room sofa, grooming herself next to my wife, Beth, or snuggled next to Beth’s leg asleep, as Beth lovingly pets her head, ears, and neck with a finger. Many pet owners lose a pet, and are so grief-stricken that they vow to never own another. As we learned, grief lasts only as long as you let it, and is greatly shortened by love. There are many rescue animals in this world, some as small as a rat, who desperately need your help. If you are grieving over a lost pet, consider ending that grief by rescuing one of these animals, and giving it a second chance. Without your help, it will be euthanized, or even worse, fed to a snake. Your life will be forever changed by the love of your new companion, and your grief will be forgotten in no time. As a bonus, you’ll be surprised to find that instead of dwelling on grief, you will remember all the wonderful times you had with your former pet.